All of these articles and images are available for licensing: click on an image to see further details and licensing options; contact us about licensing textual content. 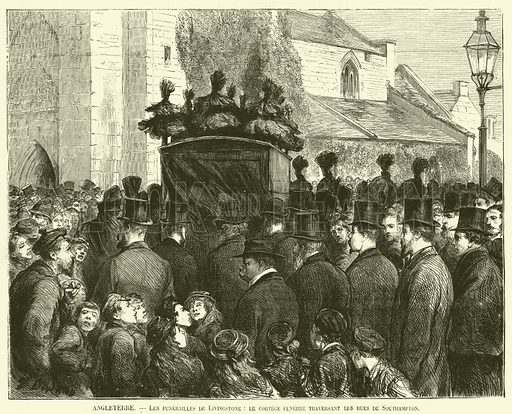 The best pictures of the late David Livingstone’s return to England are striking images of his coffin’s arrival and ceremonial parading through Southampton before being taken to London. The first picture shows flowers being placed on the coffin. 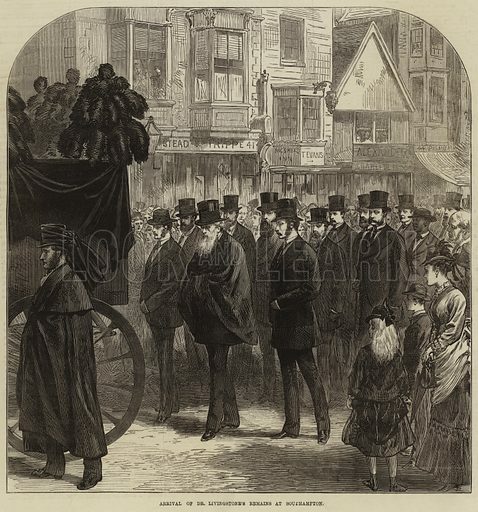 The second picture shows the solemn procession. The third picture shows another view of the send-off Southampton gave Livingstone. Many more pictures of David Livingstone can be found at the Look and Learn picture library. 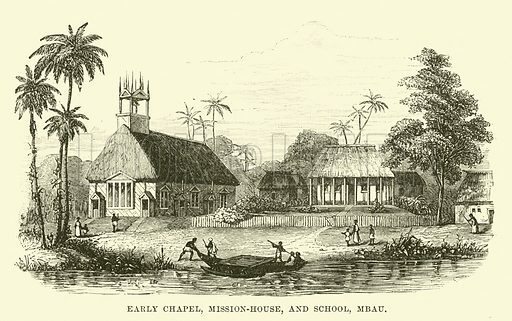 The best pictures of Christian missionaries in Fiji are images of the various buildings erected by them for worship. The first picture is of the very first church. 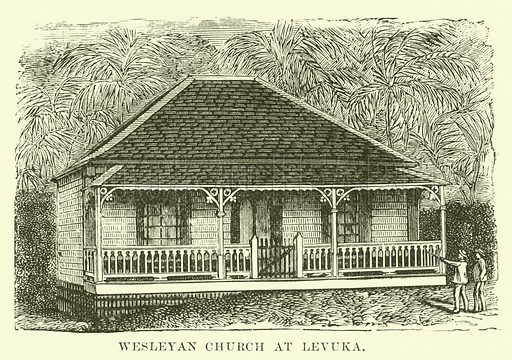 The second picture shows a Wesleyan church in Fiji, which a century later would have grown into the State Church. The third picture shows church and school buildings in Mbau. Many more pictures of Christian missions can be found at the Look and Learn picture library. 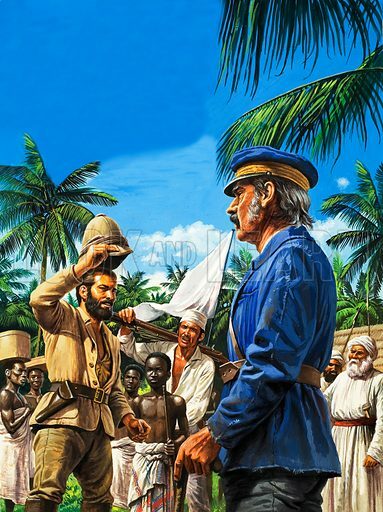 The best pictures of the “immortal meeting” of H M Stanley and Dr Livingstone at Ujiji are superb images of this legendary encounter. The first picture is a close-up of their meeting. The second picture of the meeting is in the manner of a great history painting. The third picture shows the famous pair raising their hats to each other. 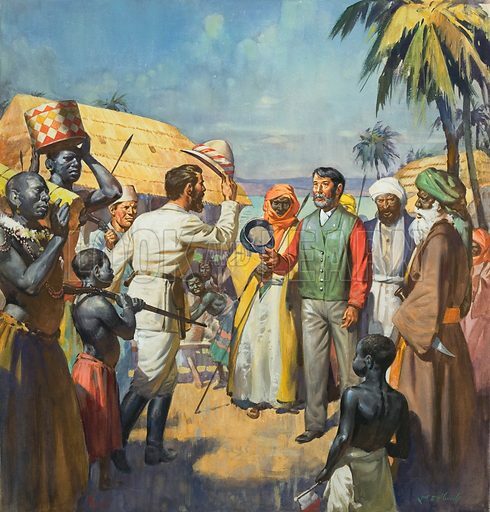 Many more pictures of African explorers can be found at the Look and Learn picture library. 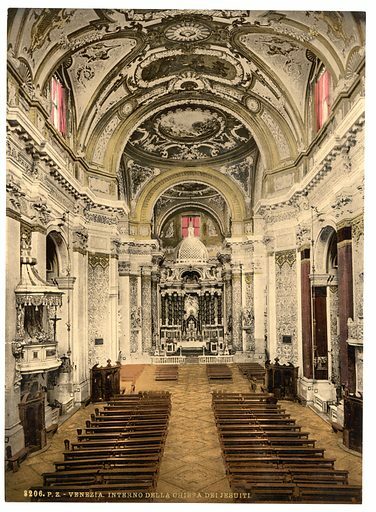 The best pictures of Jesuit churches show buildings across the world revealing the missionary zeal of the Society of Jesus. The first picture shows the Church of Santa Maria Assunta known as I Gesuiti in Venice. The second picture shows the Jesuit Church in the capital city of Madagascar. 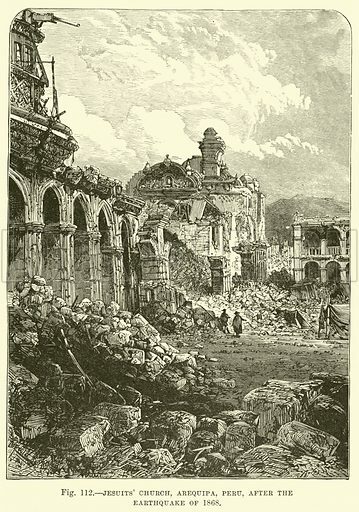 The third picture is of a ruined Jesuit church in Peru. 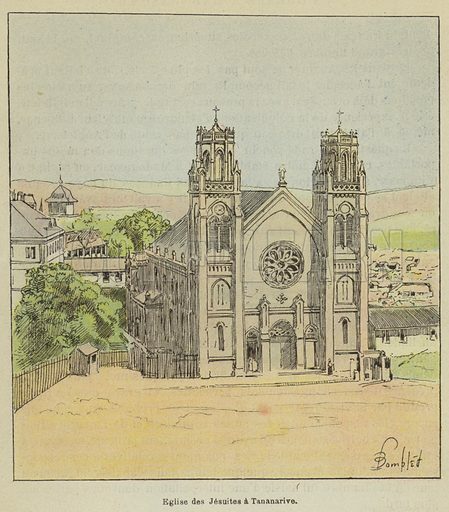 Many more pictures of Catholic churches can be found at the Look and Learn picture library. 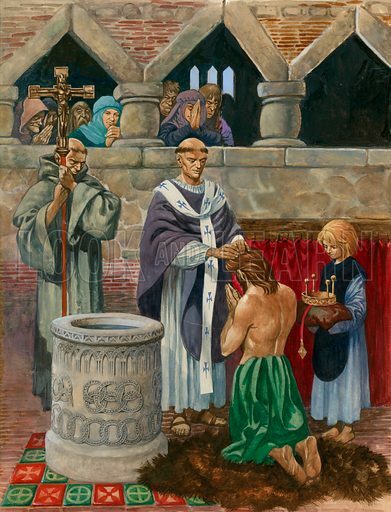 The best pictures of Saint Augustine show him arriving in Britain and performing various sacred rituals as England’s first Archbishop of Canterbury. 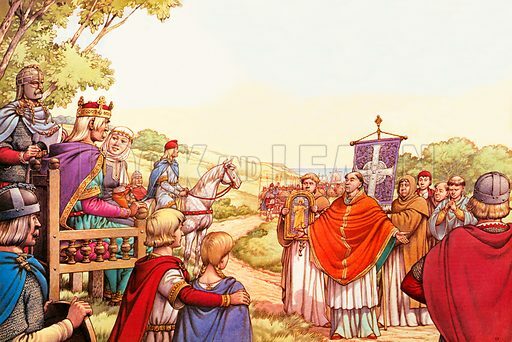 The first picture shows Saint Augustine’s arrival in the Kingdom of Kent. The second picture shows Augustine preaching to Ethelbert, the Saxon King of Kent, in 597. The third picture shows Augustine baptising Ethelbert. Many more pictures of the Archbishops of Canterbury can be found at the Look and Learn picture library. This edited article about Gladys Aylward first appeared in Look and Learn issue number 522 published on 15 January 1972. Shortly after sunrise, the band of orphan and refugee children started out on their long march to safety. Singing hymns at the top of their young voices, they left the only real home most of them had known, heading towards the mountains and the walled city of Sian, in North China. They knew they might not reach Sian alive, but despite this they showed few signs of fear. To many of them the journey was a wonderful adventure. And they all had faith in Ai-weh-deh, the small Englishwoman who was their friend and leader. Ai-weh-deh would guide them and protect them from the Japanese soldiers who were devastating the nearby towns and villages. In Chinese, her name meant “The Virtuous One,” and the mission children knew her only as this. They watched her lovingly as she marched along with them, making sure that the stragglers and younger ones weren’t left behind, and keeping the more daring boys in check with strong blasts on her whistle. Soon they had left Yangcheng behind them. The mission there – the beautifully-named Inn of the Sixth Happiness – was a bomb-shattered ruin. The children would never sleep in it again, and Ai-weh-deh had somehow to provide for a hundred boisterous youngsters, aged between four and fifteen, who had no money, and nothing to eat but a basketful of millet. On the first of the twelve nights of their march, they sheltered in a Buddhist temple which was presided over by a single priest. The millet was quickly eaten and, as the children fell contentedly asleep, Ai-weh-deh wondered who would befriend them next. She couldn’t help wondering, too, whether she would ever see England and her home in London again. Eleven years previously, in 1930, Ai-weh-deh had been Gladys Aylward, a young London parlourmaid who dreamed of becoming a missionary in China, and who had saved every penny of her meagre wages to pay her fare out there. It took her months of hard work to raise enough money, and when she eventually arrived in the Chinese town of Yangcheng, she was practically penniless. Not only that. 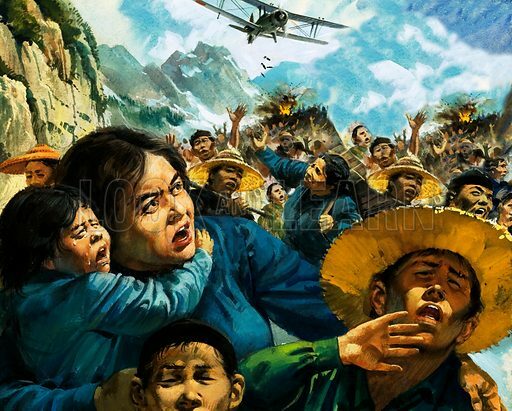 She spoke no Chinese, and she was greeted by the people she hoped to help with great hostility. The children called her a “foreign devil,” laughing when their mothers jeered at her, and throwing dried mud after her in the street. But neither mud nor insults could dissuade Gladys Aylward from her purpose. She cared little for ordinary life, and felt she owed it to God to live selflessly. She became friendly with another missionary in Yangcheng, a frail Scottish woman called Jannie Lawson, who had spent more than fifty years teaching the Gospel in the rough, mountainous country north of the Yellow River. Together they decided to turn Mrs. Lawson’s house into an inn. The town was a recognized stopping place for mule caravans, and they could cater for the hardy muleteers, who led their teams all over north China. If the men were well looked after, fed tasty meals and given comfortable beds, they would tell everyone they met that the “foreign devils” were not so fearsome after all. And if they could be induced to listen to sermons while they ate, then the Inn of the Sixth Happiness would really be a place of God. This edited article about medical missionaries first appeared in Look and Learn issue number 505 published on 18 September 1971. Everyone who knew him expected Dr. Theodore Pennell to have a brilliant career in London. He was urged by his friends to set-up practice in Harley Street, where he would make both a reputation and a fortune. But his choice of a “living” surprised and dismayed his admirers. 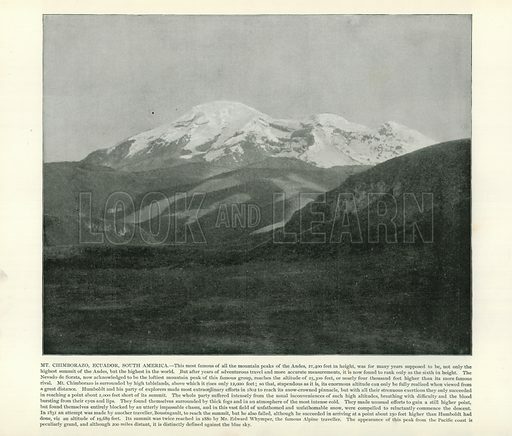 After making careful enquiries, he decided that he would be of most use in the hills of Northern India, where the sick were tended to only by travelling hakims, or doctors, whose methods of healing were primitive and painful. Having made his choice, Dr. Pennell then began to learn the local languages, Persian, Pushtu and Panjabi. To someone completely unaccustomed to the strange and difficult tongues it was an arduous task. But the doctor was used to overcoming obstacles, however long it took. He was born at Clifton, a suburb of Bristol, in 1867. His father was a doctor, and the young Theodore proved to be a sickly, ailing child. Until he was thirteen he could not play games or join in the boisterous fun of his schoolmates. Then, after years of struggling against bad health, he suddenly became fit and strong. By the time he was twenty he was over six feet tall, and as sturdy as any man he knew. But his long period of illness had left its mark, and he resolved to spend his life helping children as weakly as he himself had once been. This edited article about missionaries first appeared in Look and Learn issue number 488 published on 22 May 1971. It was Friday, 6th January, 1956. On a strip of sand by the Curaray River, which they called Palm Beach, five men in T-shirts and jeans worked busily. Anxiously, they looked at intervals towards the deep jungle of Ecuador. Nate Saint, the pilot, fiddled with his yellow Piper Cruiser; Peter Fleming was cooking. Roger Youderian, Jim Elliot and Ed. McCullay shouted into the dense foliage, phrases of friendship and reassurance in an obscure Indian tongue. Suddenly their calls were answered and three Indians stepped out on to the strand – a man, a woman and a girl. They were Aucas, members of a ferocious tribe of primitive Indians, who had slain the few white men bold enough to violate their territory. Now, at last, the five Americans from a missionary organisation had succeeded in overcoming the Aucas’ suspicion and resentment. The Americans had worked slowly and systematically to make their missionary enterprise a success and had begun to fly regularly over the Aucan country. They discovered the Indians’ settlements and, dubbing one Terminal City, they began to drop gifts there. Kettles, knives and gaily-coloured clothing were trailed at the end of a long wire to entice the Indians into the open. One day, the villagers of Terminal City caught the line to which gifts had been attached and tied to it a present of their own – an elaborate head-dress. This edited article about Canada first appeared in Look and Learn issue number 465 published on 12 December 1970. It was Spring, 1649. The monks saw the charred stumps of the pallisade in the distance and behind them, stark against the fresh-fallen snow, the blackened remains of the cabins of St. Ignace. Regnaut, the lay-brother in charge, halted his party. He sent two Hurons ahead as scouts; they re-appeared soon afterwards, as noiselessly as they had left, and reported that the Iroquois had gone. Regnaut led his men forward into the village; they stopped in the open central area. The two bodies lay there, some distance apart and barely recognisable. Regnaut, holding himself tightly in control, ordered them to be buried, then turned to the Huron villagers, women and children most of them, who had come forward gradually from their hiding-places. For two hours he listened to their eye-witness accounts, accounts in which horror was piled on horror. Then he led his party back to the mission headquarters at Ste. 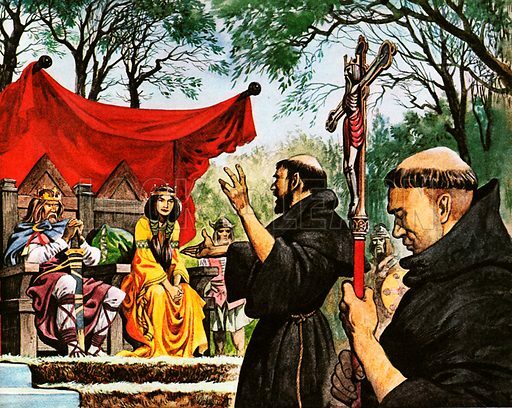 Marie, taking with him the bodies of Father Jean de Brebeuf and Father Gabriel Lalement – Jesuits, missionaries, martyrs and, later, saints. During the 17th century the Roman Catholic Society of Jesus was the target of much criticism. It was said to meddle overmuch in politics and to be greedy for riches. But no-one could deny the courage and sincerity of its missionaries, least of all, the fathers who served among the Indians of North America. 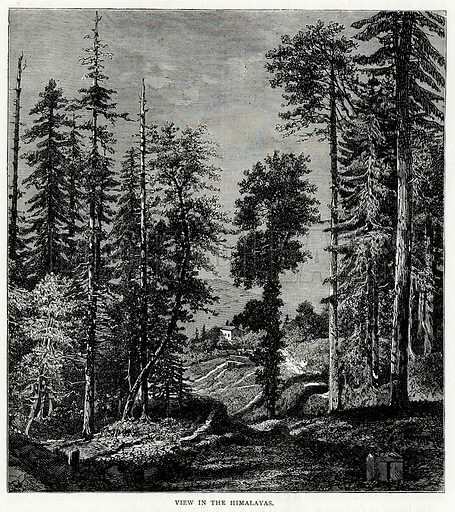 One of the most fearsome provinces of their work was Huronia, the land of the Huron Indians around Georgian Bay in the south-west corner of Quebec. Yet there was rivalry amongst the fathers for the honour of serving there. The danger came not merely from the Hurons themselves but from the persistent attacks of the Iroquois, armed with muskets, who robbed the Hurons of the goods which they had obtained from the French. There were mission stations at four villages in Huronia. Ste. Marie, the mission headquarters, was the most northerly; to the south-east was St. Louis; further in the same direction was St. Ignace; and due south, nearest to Iroquois country, was St. Joseph. With the exception of Ste. Marie, the villages were simple encampments of bark cabins behind wooden pallisades with sometimes a watch-tower for added security. Life in them was squalid. The Jesuits shared the sparse Indian diet of porridge made from Indian corn and sprinkled with powdered dried fish. Living among the Indians in this way the fathers gradually made progress. 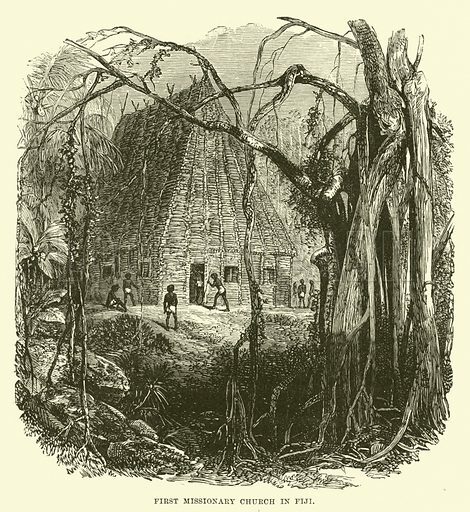 The mission station of St. Louis was manned by Brebeuf and Lalement. Jean de Brebeuf came from a noble family in Normandy and had been in Canada since 1625. He had written treatises about the Hurons and a Huron grammar and catechism. He was a big, strong man, the very opposite of his companion. Lalement, the elder of the two, was a scholar, a shy, retiring man and physically very frail. He had only been in Huronia for a short time. By spring 1649, they must both have been aware that their position was threatened. In July of the previous year the Iroquois had attacked and burned St. Joseph killing the missionary there and towards the end of that year it was clear from the fear and despondency of the Hurons that more trouble could be expected. This edited article about missionaries originally appeared in Look and Learn issue number 401 published on 20 September 1969. It was a day of misery and heartache when, in the summer of 1870, police officials toured the Pacific islands of Hawaii, posting a sombre notice in each village centre: ALL LEPERS ARE REQUIRED TO REPORT THEMSELVES TO THE GOVERNMENT HEALTH AUTHORITIES . . . FOR INSPECTION AND FINAL BANISHMENT TO MOLOKAI ISLAND. 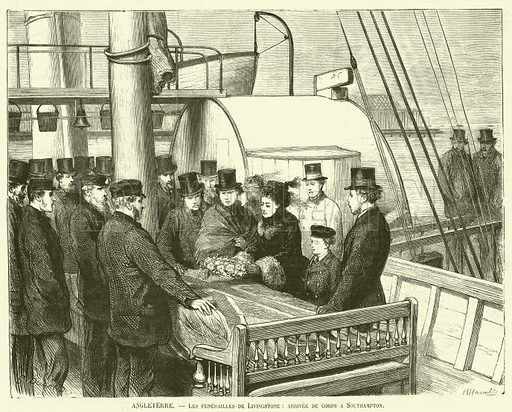 This order meant that many families would be split up, for sometimes only one person, the father or mother, had contracted the disease. One man, on learning that his wife would be taken from him, fled with her to a coastal stronghold, where he kept the police away with a rifle. For a time no one dared approach the maddened husband, who shot at anyone on sight. 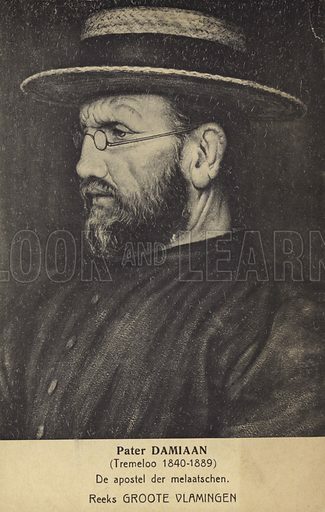 Then a missionary priest called Father Damien went to reason with the couple. He persuaded the native to surrender his gun, and agreed that the man and wife should be allowed to go together to Molokai, to live and to die there. Bereft of all human dignity, the doomed lepers lived in “defiance of divine as well as human laws.” A lesser man than Damien might have despaired of ever bringing the natives back to the ways of decency. But the priest, who was born in the Belgian village of Tremeloo in 1840, was a man of exceptional courage and humanity. His first object on Molokai was to show the lepers that, unlike almost everyone else they met, he did not despise or fear them. He mixed freely with them, eating from their dishes and smoking tobacco from their pipes. Apart from putting an end to drunkenness and theft, he acted as the islanders’ doctor, grave-digger, coffin-maker, and funeral official. Realizing that help must also come from outside, he went round Hawaii raising money for medical supplies, proper sanitation, lumber and building materials. Before his arrival on Molokai the lepers had lived in flimsy huts which were blown away by the winds which swept the island. With new homes and a supply of running water, the lepers at last began to take an interest in themselves. They knew they could not be cured, but at least they could treat each other as human beings, and try to make their community as happy as circumstances allowed. Four years later, in April, 1889, his request was sorrowfully complied with.